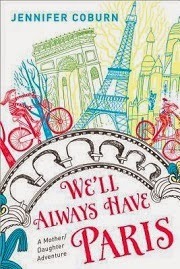 We’ll Always Have Paris: A Mother-Daughter Adventure. Jennifer Coburn. Source Books. April 2014. 400 pp. pbk. ISBN #: 9781402288630. Throughout this memoir, they travel through Europe, to Paris, Italy, Spain, England and Amsterdam. Sometimes they do the tour thing, usually with disappointing results, but their best moments are had in totally unexpected ways that are funny, poignant, frustrating, precious, and deeply memorable. Yes, they are the victims of scams, meet some nasty hotel personnel, get motion sickness on planes and trains, sleep in a famous “Shakespeare” room that is more like a New York City shelter full of homeless people, cope with skyrocketing temperatures, get caught up in the Italian version of a train strike, and other not so fun events but they handle them with humor and their “European shrug of shoulders” manner. However, there are innumerable beautiful moments when they visit museums full of gorgeous art they fall in love with, climb up the Eiffel Tower, listen to opera and symphony concerts in Vienna, meet a famous actress on their trip from Europe to London, eat at simple but delicious restaurants and bakeries, walk along the banks of rivers and streams in every country, and so much more that carries the essence of this mother-daughter journey! The tone and style of this memoir is so comfortable, relaxed, honest, raw and beautiful that words themselves feel elusive to grasp the very heart of this MUST read book. The reader is touched not only by each step of this heart-warming story that shows this author’s best writing to date. Highly recommended!